Avoca, PA WW/Press/December 11, 2015 –Rocco A. Schillaci II, Attorney at Schillaci Law LLC, was selected for inclusion in the forthcoming Top Attorneys of North America 2015-16 edition of The Who’s Who Directories. The accomplishments attained by Mr. Rocco Schillaci II in the field of Legal Services warrants inclusion into the Top Attorneys of North America. While in law school, Mr. Schillaci interned as a judicial law clerk for the Honorable Joseph M. Augello of the Luzerne County Court of Common Pleas. Mr. Schillaci has since been practicing law since 2005. Prior to entering private practice, he worked for over three years with the State Workers Insurance Fund as in-house counsel and as a member of the Office of the General Counsel for the Department of Labor and Industry of Pennsylvania with his primary focus on workers compensation law. Mr. Schillaci has handled a wide array of both civil and criminal cases to successful conclusions for his clients. His primary focus is on work injury, personal injury, and disability cases. Since opening his private practice, he has collectively obtained millions of dollars in compensation and benefits for his clients. Mr. Schillaci prides himself on his being accessible and making his clients comfortable throughout the process. He is committed to providing knowledgeable, honest, and thorough representation, while guiding his clients ’ expectations and providing any other aid that would help them during and even after their cases have concluded. Mr. Schillaci is licensed to practice in the Commonwealth of Pennsylvania and in the United States Court for the Middle District of Pennsylvania. Rocco received his B.A. from the University of Scranton and his J.D. from Penn State University, Dickinson School of Law. He is a member of the Pennsylvania Bar Association, Wilkes Barre Law and Library Association, UNICO National, and BNI – Diamond City Chapter. The Top Attorneys of North America, a New York based publication, distinguishes and profiles leading attorneys who demonstrate recognizable success and leadership in their field. The directory is valued for promoting awareness of individual accomplishments and achievement within the North American legal community. 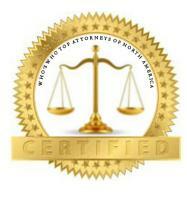 Be the first to comment on "Top Attorney – Rocco A. Schillaci II"